Chatham-Kent’s Biggest Auto Sale Is Back! Save Big Under the Tent! 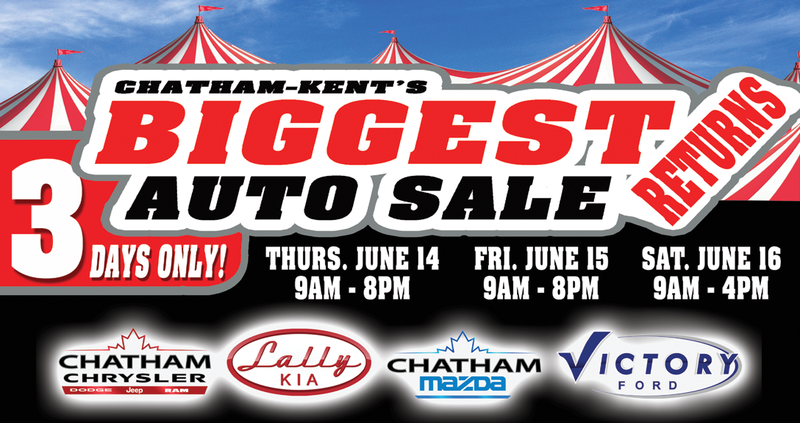 Chatham-Kent’s Biggest Auto Sale Ever! Three days. Eight brands, Thousands of dollars in savings! The Lally Auto Group Tent Sale is the best way to get into a new or used car, truck, or SUV! Looking for a new car, truck, or SUV? The Lally Group’s Tent Sale is roaring back into Chatham-Kent ! For three full days enjoy the convenience of being able to choose from eight different brands on-site, and save thousands on your next vehicle! Vehicles from Dodge, Lincoln, RAM, Jeep, Ford, Mazda, Kia, and Chrysler will all be in attendance! Don’t miss out on your chance to get financing as low as 0% for up to 84 months, and up to $14,000 in rebates on select models! Pre-Owned models are also available with no payments for 90 days! Win big with a chance to scratch-and-save up to $2500 off your vehicle purchase! This incredible sale takes place over three days here in Chatham-Kent on St. Clair Street! Find us in the Best Buy / Staples parking lot, and experience a selection of eight brands under one tent! Radio stations will broadcasting live on site to listeners across Chatham, Wallaceburg, Tilbury, Blenheim, Ridgetown, Wheatley and Dresden – so tune in for live updates and specials! No matter what make or model you’re interested in, rest assured you’ll find it at the Lally Group Tent Sale! Contact our dealers for more information about this exciting sale or reserve your spot with an appointment today! Is there a specific vehicle that you’d like to see? Drop us a line and we’ll get you behind the wheel!